What does your TO DO list look like right now? Does it seem so overwhelming that you aren’t even sure where to start and so why bother starting at all? – or are you the type to get loads crossed off every day and are in control of things, even though things keep getting added to it? Whichever you are, my betting is that you always have something on your TO DO list at the end of each day. So – is it really possible to get it down to nothing – or are we forever chasing an impossible dream, and beating ourselves up in the process for not getting everything done….. I asked this question a while ago to all the lovely people following my Facebook page (thanks if you do – and if you want to then just CLICK HERE!) – and everyone was in agreement that there was no way your TO DO list could ever be blank…. 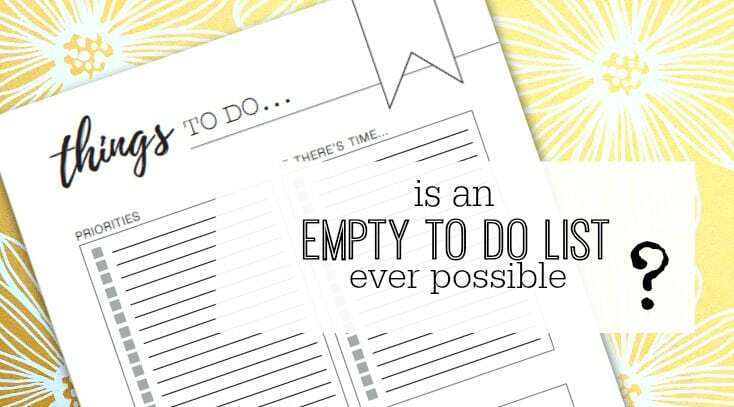 I’m in full agreement that you should write a daily TO DO list and only fill with a few things so that you don’t let overwhelm set in. Having only a few things to do each day means you’re much more likely to get them all done, and feel great as a result. There’s nothing worse than having a TO DO list that keeps getting pushed to the next day…. The aim for your DAILY TO DO LIST would definitely be to have it empty by the end of each day – and that’s totally possible if you stay realistic as to what you can achieve in the time you have. What WOULD be great to be able to leave at zero would be our main TO DO list – the MASTER TO DO LIST. So – how is THAT achieved?, and can it be at all? I talked in a previous post about how to organise your Master TO DO list so that it’s more manageable, but didn’t cover whether it would be possible to get everything done ever. My thought on this – unfortunately I really don’t think it’s possible, NO. Because life gets in the way. No sooner have you got one task done, you will find that that either creates a new task, or someone else has created one for you. Your TO DO list is a cyclical beast! What IS important to understand and acknowledge when you have a TO DO list is whether things are staying on the list for too long. Your TO DO list should manage tasks – both incoming and outgoing. That’s the way they become uncontrollable and feel never ending. Basically – the older something is on the list – the less likely it is going to get done. It’s been on there for so long you have to wonder whether it really needs doing at all…. It’s the same with anything – you are happy with a specific item in your home until you see a new version – and then you want that. With TO DO’s – the newer the task usually the more urgent or relevant to your life it is and so the more likely you will deal with it pretty quickly. HOW CAN YOU TACKLE THE TO DO’S THAT STAY AROUND FOREVER? Some organised people suggest adding a date to your TO DO list when the task was added – and to scan to see what’s been on there the longest – getting those done first when you are looking for what to tackle next. Others suggest rating the tasks from 1-5 for both urgency and importance (5 being the most and 1 being the least) – multiplying the number together to give each task a rating, and then working through them like that. I think that both of these can be very time consuming, and in the amount of time you’ve spent working out what TO DO – you could have actually done something instead! However – if they work for you, then by all means use them…. 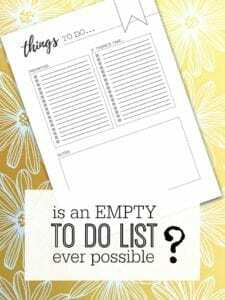 What I think is the simplest way is to get in the habit of using your TO DO list each day, then simply adding things to the bottom of the list as they come in, and starting at the top of the list when you are adding tasks to the diary. AND – Always be realistic with what really needs doing and what can go. Regularly check through and cross out anything that has been overtaken by other things or that aren’t relevant anymore – you may be surprised at how many there are! If (and I suggest you do!) you create sublists on your MASTER TO DO LIST – with categories such as home projects, family stuff etc… – then just add to the bottom of each sublist and try and balance the time you spend on each category. BUT – WHAT ABOUT URGENT TASKS? Urgent tasks by their very nature should be date specific, so can be added to your diary within a specific time frame anyway – so should never even hit your TO DO list. For your MASTER TO DO LIST we are only ever talking about tasks that can be done at literally any time in the future, and if anything suddenly becomes urgent on your TO DO list you should usually be able to scan and see it quickly if you look at it everyday. What IS important though is to make sure that things don’t stay on there for long – as these are the tasks that will make you feel worse every time you look at the list, and who wants to feel bad?! Simply put – It’s not about getting to zero on your TO DO LIST – it’s about managing it so it doesn’t overwhelm you. – and you never know, if you keep on top of things then one day, maybe just maybe, you may find yourself staring at a blank piece of paper that is titled TO DO LIST……. I can dream can’t I! Previous Post: « DARK WALLS – IT PAYS TO BE BRAVE WITH COLOUR.. Interesting. I create a “to do list” when I find several projects that I want to work on. Then I choose which one to work on as I find time. Some are quick to accomplish, some will take several hours or even most of the day to finish. Feels good to cross them off the list. Currently working on a large closet off our living room. Over-run with books, blankets, candles, seasonal items, etc. Thinking I will need more shelving but won’t rush into it until I figure what goes back and where (which I think is something you were advising us to do in one of your posts).